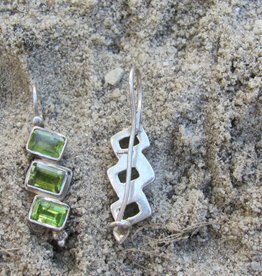 Silver earring set with a peridot stone, facet cut. Made by a master craftsman in a workshop with good working conditions in Sitapura Jaipur Rajesthan 2 cm long excluding the ear hook. Fairly made with respect for all employees. 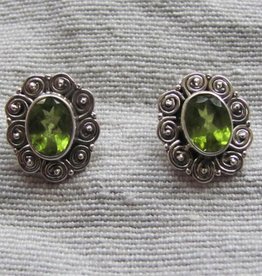 Silver earring with three peridot stones . Totally handmade, even the stones are handcut. made in Jaipur India by a master craftsman in a workshop with great working conditions. Dormeuse model. 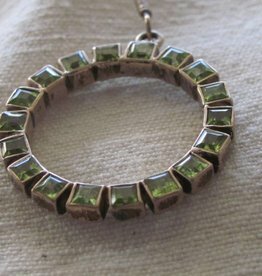 Total length earring 3.5 cm. Hand made earring with a faceted peridot and cabouchon cut amazonite 2,50 cm excluding the ear hook. Hand made silver earrings are made by a master silversmith in a workshop with good working conditions in Jaipur . de stenen zijn ook met de hand geslepen.